Teresa Brewer was an American singer whose style incorporated country, jazz, R&B, musicals, and novelty songs. She was one of the most prolific and popular female singers of the 1950s, recording nearly 600 songs. Many of her hits are included on this CD. 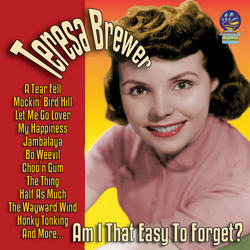 For her contribution to the recording industry, Teresa Brewer has a star on the Hollywood Walk of Fame at 1708 Vine Street. In 2007, she was inducted into the Hit Parade Hall of Fame. One of Elvis Presley’s first public singing experiences in 12th grade was performing a song of Brewer’s: “Till I Waltz Again With You”. The song is featured on this CD.